Morocco, Rabat. Eid - where is Bob? 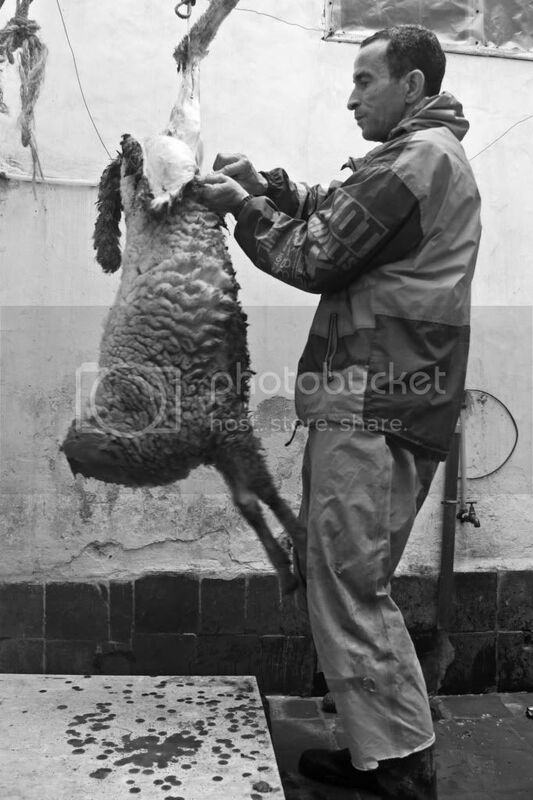 Abdelrahim's house in Rabat became the first place where we killed a sheep. From the experience in the city I learned the most about recipes and religious matters. It was easier to communicate with them while having dinner because most of the members of the family spoke French and English. While showing you pictures I'll be placing random facts about this Eid, and pieces of information I came across while photographing it. No particular order, maybe not even related to each other, but nonetheless interesting. It was a very informative thing to do, and at first almost scary. Coming from Mexico I had never been involved in sacrificing an animal like this. It was a very different cultural experience, and I ended up enjoying it a lot. Great food. 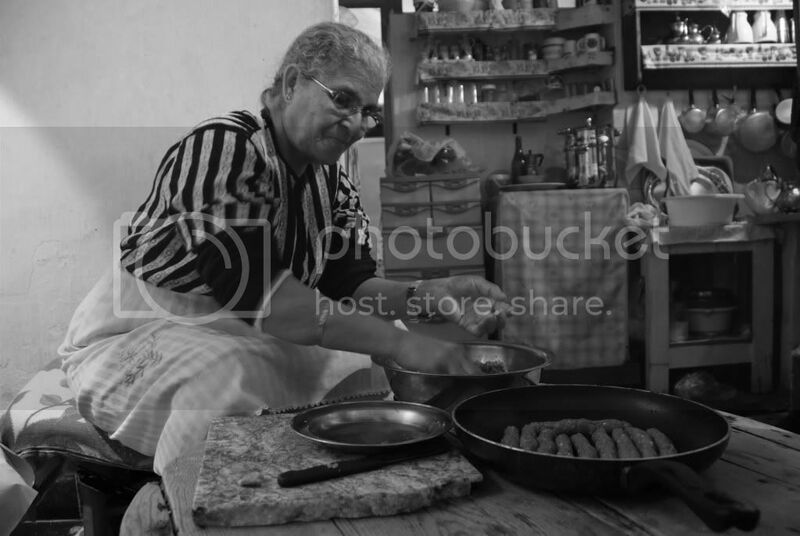 Abdelrahim's mother making kefta, which is minced meat with spices rolled up into the shape of some sort of intestine-free sausage. Touria, Abdelrahim's mother and the cook for the whole Eid,didn't speak English bu we also managed to understand each other by signs and pointing at ingredients. I was able to get a lot of good recipes from this woman, her food was very good. We found the sheep in one of the cattle souqs of Rabat. The seller was very proud and showing us the sheep's best attributes. 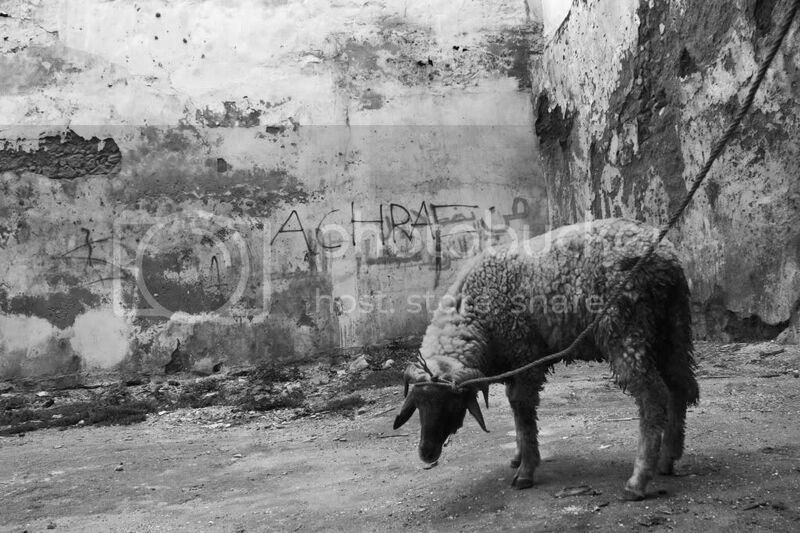 When we brought back the sheep from the Rabat souq, he came in the back of the car. We reached the medina and walked with him like as if he was a dog.Although, most seep will not walk unless you walk behind them. Sometimes it is impossible to make them walk, and you will be better off carrying the animal on your shoulders. Little sheep walking around in the medina, he stopped at a garden that is always filled with cats, maybe he felt comfortable seeing green grass again. Slaughtering the animal was an experience. 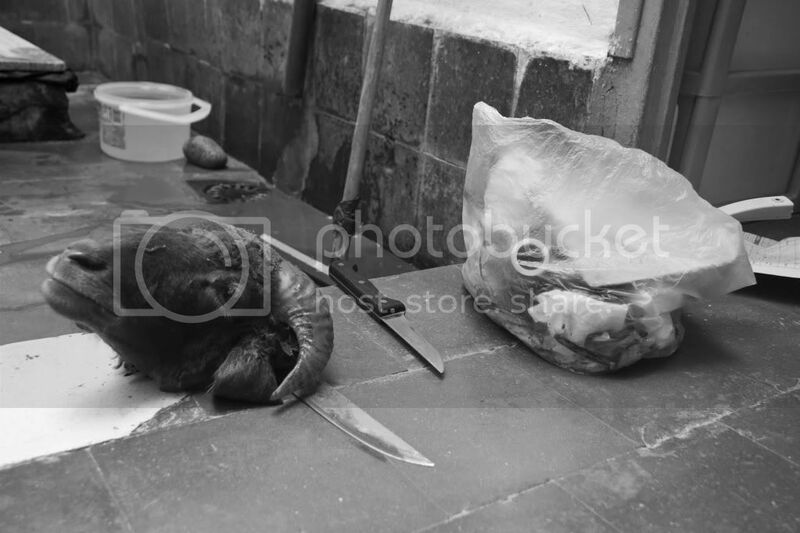 The butcher, Wafi, came in early in the morning and he had 3 different knives. One of them, the one used for gorging it, had "Bismillah" written on it. 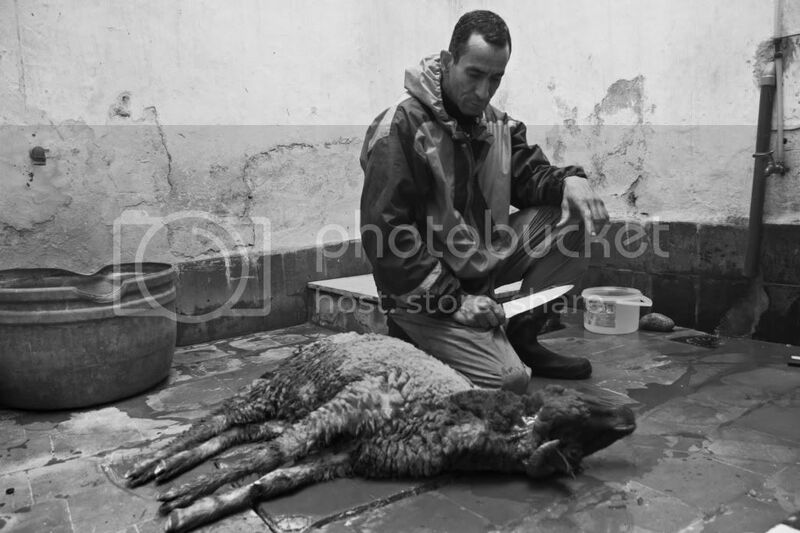 Abdelrahim and Wafi held the sheep down, and with just one movement from the butcher's hand, and the sheep was gone. In Islam, blood is an extremely polluted substance than should not be consumed. 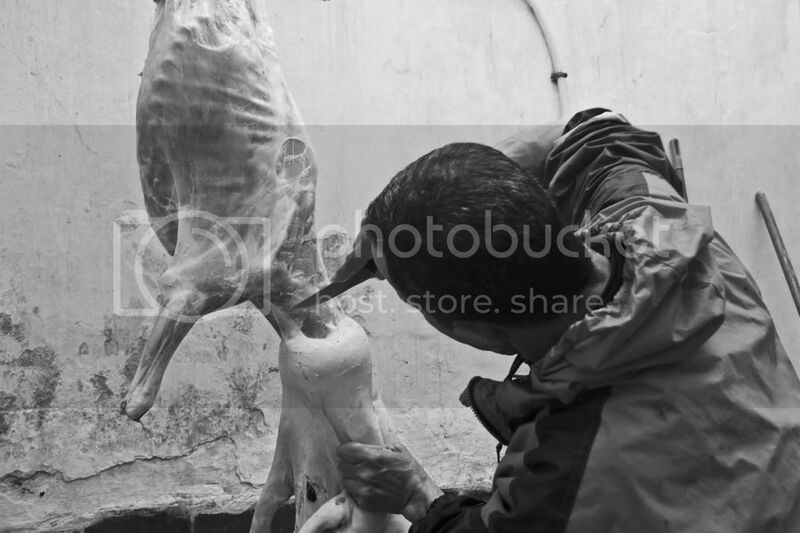 This is the reason why in Morocco, animals are gorged to drain the blood out first, and then continue skinning the animal. Later they are opened from the belly, to expose all the organs that have to be cleaned and rinsed. 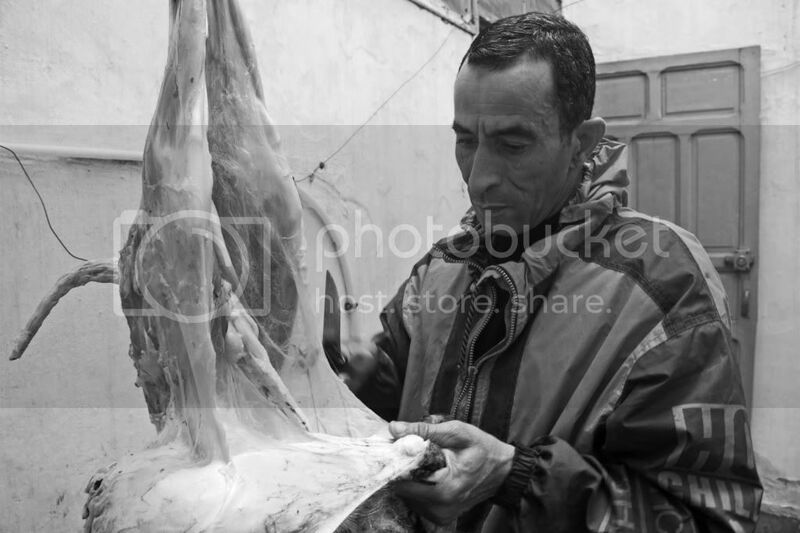 Finally, they empty the sheep from the inside and keep the meat for later preparation. Organs are served on the first night of the Eid tradionally, I suppose it has to do with the fact that they have to be consumed faster because they might be useless if they are left out for a long time. this picture hows the reflexes of the body after death. 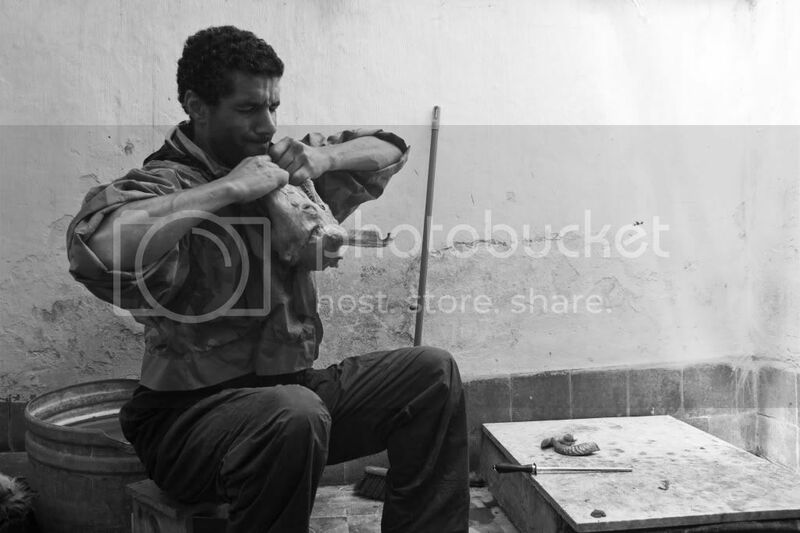 I like it that in the picture before, both, the butcher and the lamb are steady. 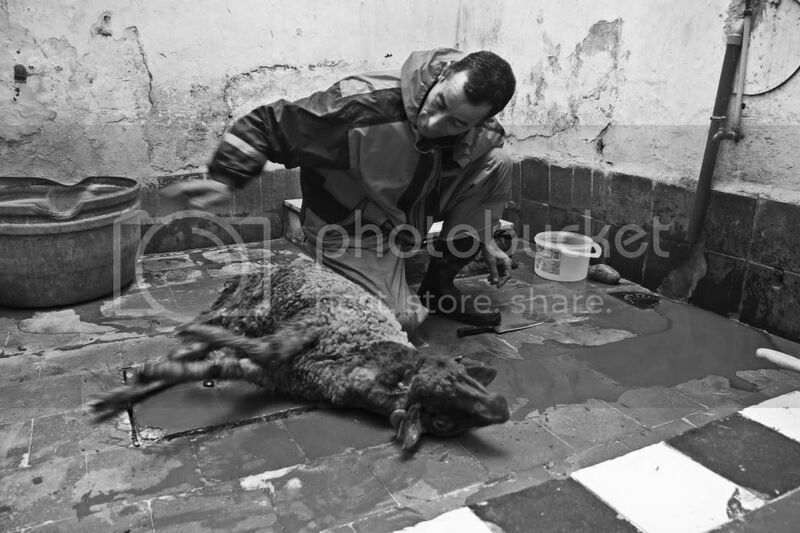 The second picture, the lamb's legs are moving fast and so is Wafi's hand. Nice coordination of a dead and alive creatures. 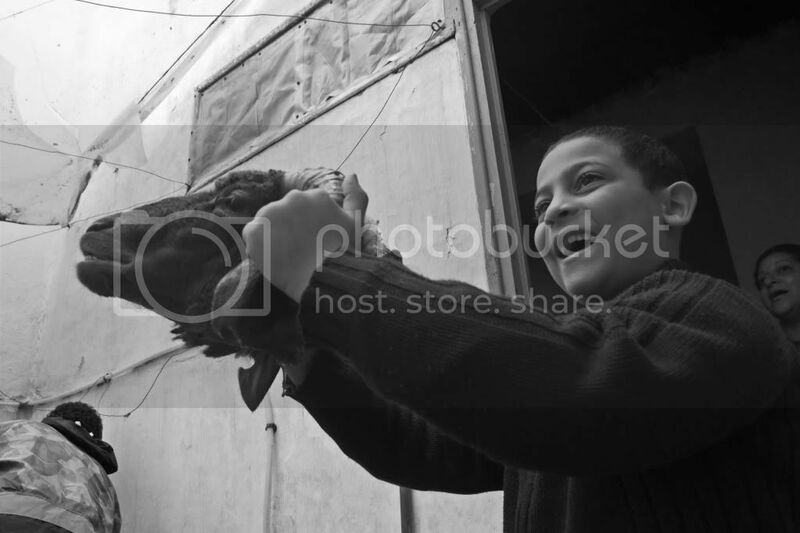 It was impressive to see how little Abdullah was comfortable playing with the head. After all he has been involved in as many celebrations like these as his age (8). Not to mention that Eid Al Kbeer is not the only time when Muslims serve a whole lamb. Some other celebrations that do this are: "Mawlid", the celebration of the Prophet Mohamed's birthday, "Gat'aza", when someone passes away, it is cooked to mark the end of formal condolences. Skinning the animal down. 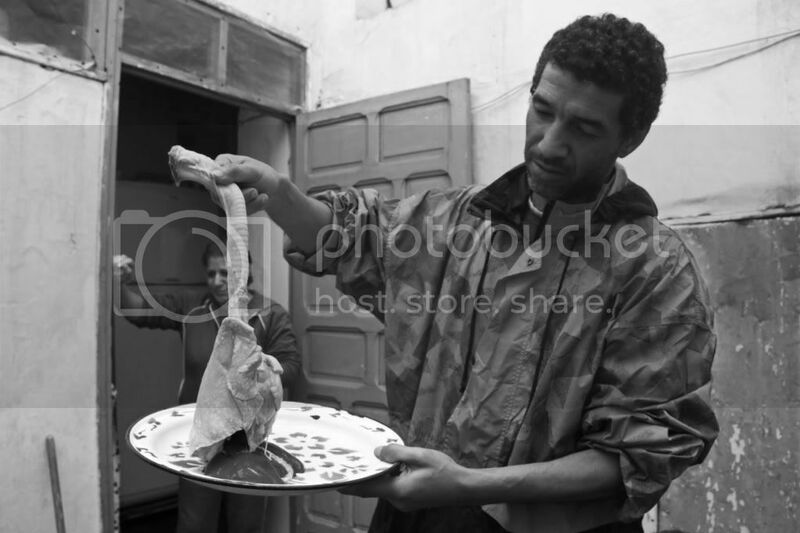 He started by the back legs, and Abdelrahim mentioned that is the traditional way to do it. Before, people used to poke a hole in the animal's legs and blow air in it to make the skin easier to come off. Now, in the city, people are stopping this practice because it is said that if the person doing it is sick, it can be transfered to the meat and organs. The head has to be taken off prior to skinning it. This pictures explains why. Removing the vital organs can be tricky. If the person doing it accidentally breaks the appendix, it will ruin the flavor. The appendix has to be located as soon as possible and removed carefully. The stomach is very hard to clean because it has a very rare texture and it holds a lot of secret foldings. People in the city sometimes scrape the texture off with a knife to make it cleaner. The stomach, and the lungs, were filled with running water and then emptied a couple of times. It is amazing to see how much these organs expand. The intestines are the longest organs in the body, and as disgusting as it may sound, they come out with feces most of time, that have to be removed and then cleaned thoroughly. The liver and the pancreas have to be burned a bit before chopping them in to cubes for skewers, this is because of their grainy texture. The testicles are very important, because in this Eid it has to be a male sheep that is eaten. Finally, the head is skinned too and then opened to reach the brains that were served along with the other organs that night. In Morocco nothing goes to waste, almost everything is eaten. 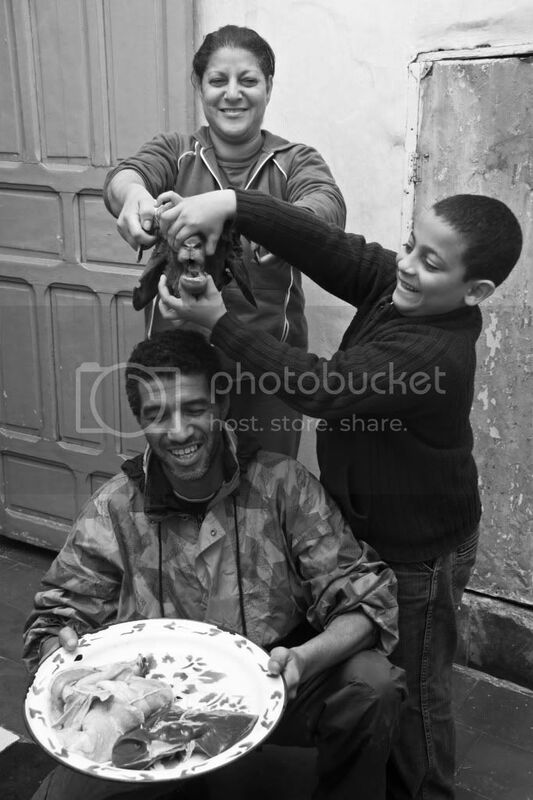 Abdelrahim, with his sister Chmissa and little Abdullah, all displaying the upcoming food! The medina of Rabat provided so many ingredients and spices to the dishes. To mention some spices: salt, pepper, powdered parsley, pepper, ginger powder, cinammon, sugar, Ras alhanout (literally, "head of the shop" is a mixture sold whose recipe is a secret only known to the boss of the shop), saffron, turmeric, etc. The spices used in the Eid are not everyday spices, they are special for the occasion. This creates some expectation for the flavors. Sort of like Christmas, and Thanksgiving, they are expected all year by family members because it is so good, but it can only be served in one day. Thank you Abdelrahim and family. Eid mabrook!